As a small business owner or entrepreneur, you wear a lot of different hats. You’re responsible for every aspect of your business’s success, but some of the tasks necessary to keep a business running are hardly the best use of your time. Bookkeeping and taxes are undoubtedly vital to your business, but they can divert your attention away from other important activities that need your consideration. Besides, you can hardly expect to be an expert at everything. It’s a far better investment of your time and resources to hand over these “necessary evils” to an expert who can complete them faster and more thoroughly than you could. 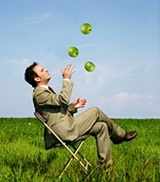 At Green Apple Resources, we do more than provide you with a reprieve from undesirable financial tasks. We also provide you with the tools you need to ensure that your taxes are filed correctly. Our bookkeeping service allows you to stay on top of your finances throughout the year so you won’t be surprised when tax season rolls around. Knowing where you stand at all times will help you stick to a tax strategy, allowing you to save money on taxes and prevent costly mistakes. More than that, having accurate financial information allows you to manage your business. Knowing how much money you have at all times enables cash flow forecasting to ensure that you never run short. Stop spending 10-50 hours a month on bookkeeping tasks, and focus on the activities that give you the highest ROI (return on investment). Our service offers the knowledge and support you need to be assured your books are perfectly in order. To learn more, explore our Core Resources for small business owners, or see which of our Core Services best suits the needs of your business. You can also learn more about Green Apple’s history and vision. Once you’re comfortable that our service is exactly what your company needs, contact us for a free consultation. There’s no strings attached: If you don’t like what you see, you’re not committed to anything. We’d love to hear from you, and your highest-ROI activities are waiting for your attention. Then contact us for a free, no-strings-attached consultation.